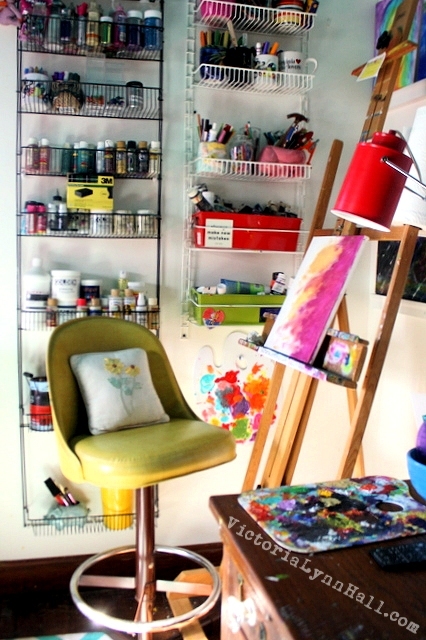 My most popular post of 2014 was... drum roll, please... Art Studio Redo! It also happens to be me favorite project of 2014. 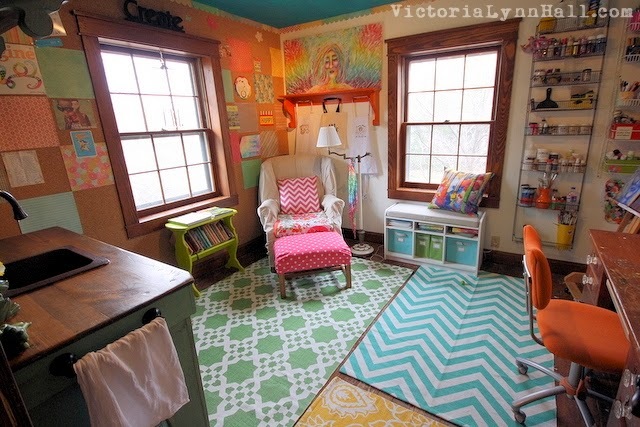 I admit that when I redo a room I put a lot of consideration into what I want it to look like. However, I have learned over the years that form needs to follow function. In this room in particular, I knew I needed to keep in mind how I wanted to use it and what was and was not working for me at that time. What wasn't working was the closet. It was too big and just allowed me to hold onto things that were no longer serving my creativity. However, on the two walls that I eventually knocked down were a couple of things that sort of worked: My bulletin board and my chalkboard. 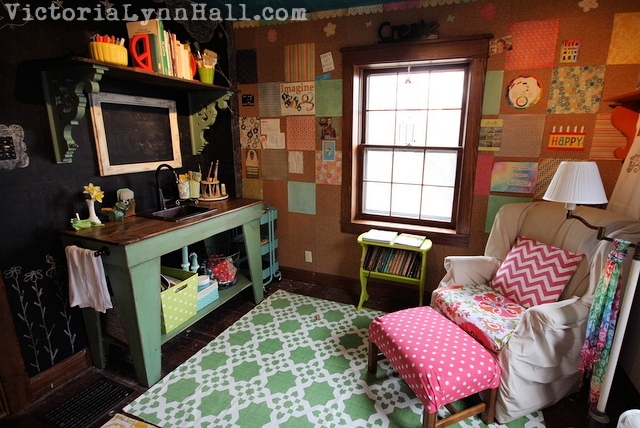 A closet that was too big and a chalkboard that was too small. The only problem with them was they were too small, so I created new super sized versions of them. 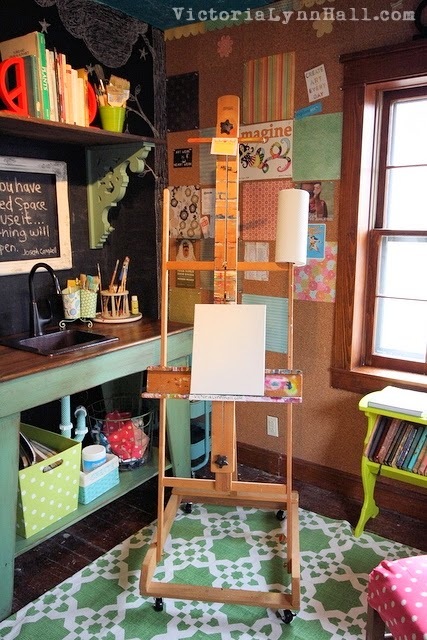 A chalkboard wall and a cork wall were just what my art studio needed. Of course the biggest change in terms of looks and functionality was adding the new worktable and sink. It has made clean up so much more convenient and the sink area in our guest bathroom (aka Hippie's bathroom) is no longer paint stained and crowded with paintbrushes. 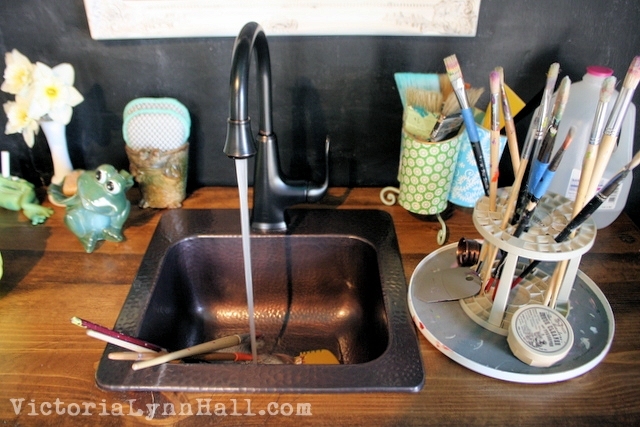 This copper bar sink is the perfect size for my work table. I just love it. One thing I thought would be more functional than it has turned out to be was my easel after Hippie put it on casters for me. My Artist's Easel On Casters. I thought it would allow me to paint in various locations around the room but I guess old habits die hard. I still tend to paint in the same crowded little corner of the room I always have. Those pantry racks you see on the wall in the picture above have always been there. They may not be the most attractive solution but they are extremely functional for me. I have learned that I tend to be more inspired, productive and organized when I can see all of my supplies. However, with the closet gone, I found that I did need just a little more storage space. I also just really liked the look of my Ikea storage cart. Win/win! 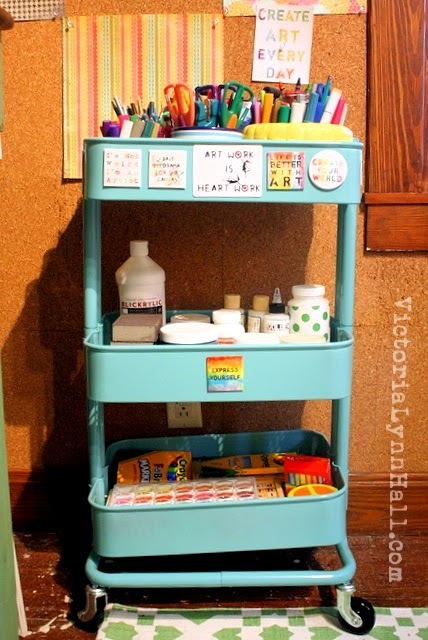 I really do love this cart! Another thing that was already working for me and my feline muse and assistant, Princess Poe, was my thrift store wing chair. After splurging on the sink, I didn't have enough left in my budget to upgrade it to something more stylish. 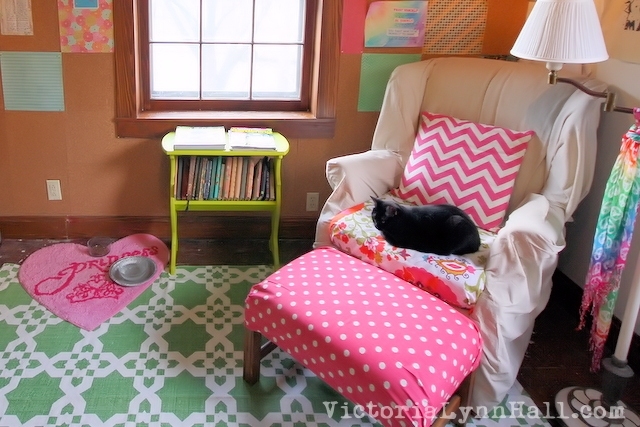 However, I did recover the seat cushion and ottoman in some fun fabrics. Poe also got her very own Princess rug for her food and water. 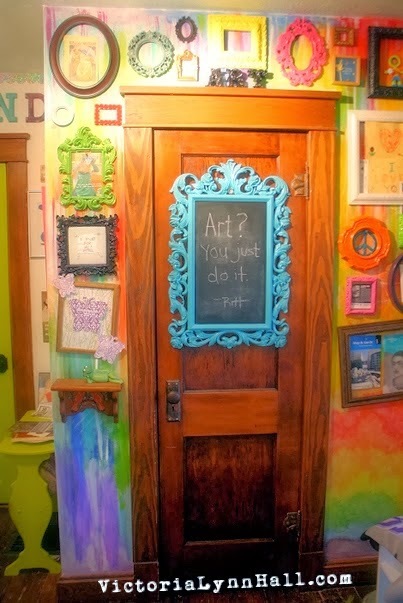 Hippie and I sometimes refer to my art studio as "Poe's room". Overall, I think my art studio redo resulted in the perfect blend of form and function. I could not be happier with it and I'm very pleased that it topped my list of my most popular blog posts this year. 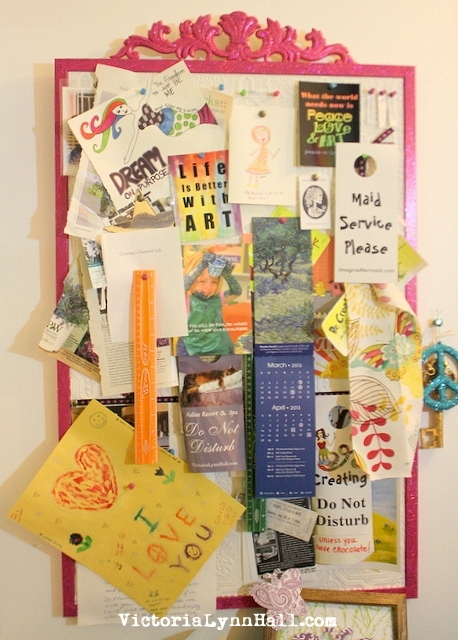 Thanks so much to all of you who read this blog for being a part of my journey as an artist, homemaker, recovering perfectionist and Slave To The Muse in 2014. Your interest, support and encouragement mean the world to me. 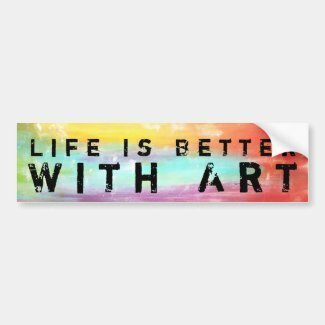 Design your own custom bumper sticker at Zazzle. 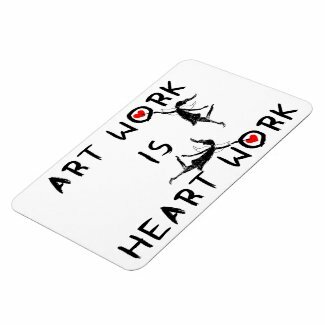 Design unique personalized fridge magnets from zazzle.com.